Download works fine for me. Scrip blockers etc. may block the download though so if you have umatrix or the like, do disable them before trying to download the game. You may also try different browser if you have such installed. There is not going to be any further updates to the itch.io prototype/demo. All further development is going toward the commercial Steam version. The Steam version of Raft already has Creative mode along with Peaceful, Easy, Normal and Hard difficulties. That error indicates that your graphics card does not support the shader model required by the game so only way to fix it is that you and others affected get newer/better graphics cards. Why should it be removed? Itch.io is full of incomplete and abandoned games and demos of commercial games sold elsewhere so why would Raft prototype be a special case? Raft community · Posted in Steam key? There was never option to buy the game, it was always free on itch.io. You could however voluntarily donate to help the development. And no, having donated towards the itch.io version does not grand you free copy of Steam version. So yes, you have to buy the Steam version if you want to get it. It has been on sale several times so you can wait for next sale if you don't want to pay the full price. Last time it was on sale was during the Lunar New Year Sale in January with 20% discount. It'll probably be again on sale during the Steam Summer sale at the latest. We very much appreciate all the support and feedback we have gotten from our community, however, playing or donating to the itch prototype will not grant access to the Steam version of Raft. Raft community · Posted in Raft for win 32 version is virus? False positive most likely. The archives I've downloaded (both 32 and 64-bit) had none at least according to my virus scanner. Raft community · Replied to tuxgamer in Can there be creative? Raft community · Posted in Can there be creative? 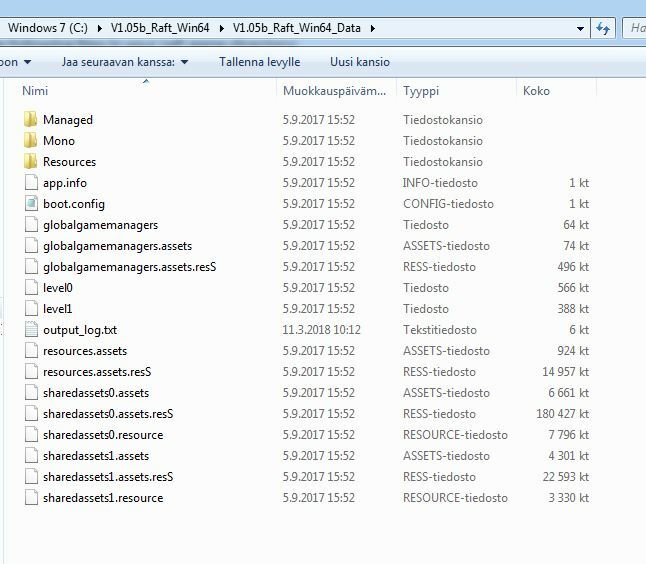 If app.info and other data files are in the same folder as the executable (they need to be in the V1.05b_Raft_Win64_Data folder), you've extracted the archive wrong. Go to store page, scroll down until you see four download links between install instructions and community. Download the one suitable for your system. Do note that any ad or script blocker may block the links from working so temporarily disable them in case the links don't work. Raft community · Posted in I bought Raft a year ago, how do I port it to steam? Raft community · Posted in have virus ? free or need to buy ? The prototype here is free, the Steam version costs money. Sounds like your computer is overheating and shuts down to prevent components from being damaged. You should try limiting fps and trying to lower settings. I also suggest you post in Bug Reports sub forum on Steam instead of here. I doubt devs check this place much anymore if at all. Yes. There's over year worth of development since itch.io prototype was abandoned. For one, you sail around with your raft in Steam version while in itch.io prototype your raft is static. There are various weather conditions, small islands to explore and there's stuff under water around islands. There's also plenty of new tools, equipment and things to build. Steam version also has CO-OP multiplayer support. You can not. Best you can do is send the save to one of your friends and they host the game while you're not present. There are problems with shaders and other problems making builds for Mac/Linux. Devs don't currently have the manpower (it's 3 person team) to test, debug, fix, compile and maintain any other builds besides Windows. We are first and foremost focusing on Windows. We would like to support more platforms in the future but due to certain parts of the game making porting more difficult we cannot at this time give any promises. Once you've researched everything and found the end game goal, only thing left is build bigger and better raft. Currently anyway. If you're not into base building, you probably go through available content pretty fast. For people who like to build, content lasts as long as they don't tire of it (remember all those gigantic building projects on Minecraft like 1on1 model of enterprise or working computer in game or hundreds of other massive things people build with it). Just to clarify. You did not buy it, you made voluntary donation to support the developers. Itch.io raft has always been free with option to donate. And no, those who donated wont get a key for Steam version. itch.io version will no longer be updated (it hasn't for over a year) and Steam version wont be free. Raft community · Replied to matoken in Raft to enter Early Access on 23rd of May 2018 with launch price of 19.99$! Unfortunately not. Devs encountered numerous issues with shaders and other errors trying to make Linux builds. They can't support Linux right now due them lacking the manpower to maintain builds for other platforms beyond Windows. They hope to do so eventually though. Raft community · Posted in Is local coop possible on Steam family sharing? Raft community · Replied to physika23 in RAFT - Steam Price? It's free prototype and haven't been updated for over a year. As far as I know, you can't currently. Raft community · Replied to sawedoffsob in Had Raft awhile now. Can i play it through my Steam account now? Is the game the same? Raft community · Replied to TheUberCannon in Had Raft awhile now. Can i play it through my Steam account now? Is the game the same?